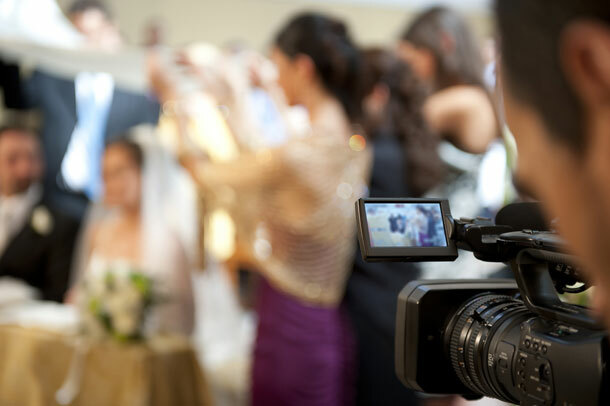 You are here \ South Africa Weddings \ Tie The Knot \ Wedding Services \ Should You Hire A Videographer For Your Wedding? Most of us list a wedding photographer as one of the essentials of a wedding. Photographs will mark the hallways, desktops and dressing bureaus in your and your families’ homes to come. It’s a given that capturing the moment is important. But do you want a video of the wedding? This is probably the question you want to ask before worrying about whether or not to hire a videographer. Some people deem it essential, others don’t want one at all. It is up to you entirely. What I do know is that many who opted out of a video regret not having done so. I’ve never been a fan of videos. Home videos come close to being my number one pet peeve (having to watch someone else’s is my second), so nothing could have convinced me to have a rather private ceremony invaded. But a close friend of mine has a different story to tell. Her parents-in-law insisted on paying for a videographer, despite her aversion to the idea. What she was convinced would be her undoing, was in fact the highlight of her wedding. Post wedding she has watched it so often, that her husband has threatened to throw it away. Your video is about documenting you and your family for future generations, it isn’t just for your viewing pleasure.